The SX Roller is a steel half-round shoe which is similar to the Classic Roller. It is an excellent choice for horses needing additional ease of breakover; for movement in performance, injuries or chronic ailments. 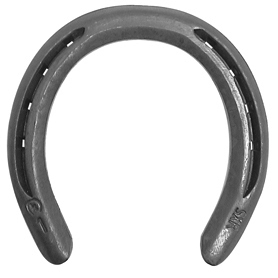 Horses performing in events such as team penning and roping require shoes that are strong and provide traction in some cases and avoid unnecessary stress when stopping in an event like roping. This shoe is best for stock work (Arena).